Latest Uploaded Videos — All of my public videos in the order uploaded (most recent first). 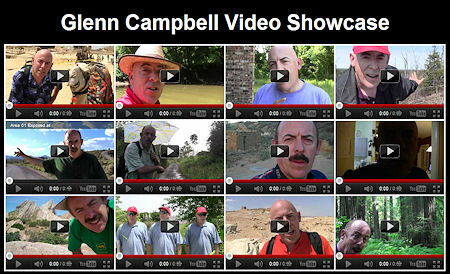 Glenn Campbell Showcase — Showing off my acting and presentation talents. Most Popular Videos — My more popular videos on YouTube, often for reasons I cannot fathom. Most popular first. One-Minute Movies — Various edited videos that are about one minute in length. Latest first. Edited Travel Videos — Travel videos I have devoted some effort to. Unedited Travel Videos ("Video Postcards") — Videos of interesting places or events around the world, uploaded directly from the camera with minimal editing. Protests, Parades & Festivals — Colorful public events. Suspense and Drama — Attempts to tell a story. Aliens! — Proof of the alien presence on Earth. Glenn's Songs — I sing my own original songs (usually badly). Glenn's Philosophy Talks — Philosophical discussions from the road. Uploaded without editing. Standup and Voice Samples — Experimenting with my own voice and presentation. Personal Interest — Various family and personal videos that I don't mind sharing with others. Vimeo — For future use still to be defined. The first 45 of my videos were uploaded to Facebook, including my very first uploaded video, A Rooster Eats My Ice Cream, shot on my Blackberry in May 6, 2010. (Most of the significant Facebook videos were later re-uploaded to YouTube, but a few short ones can be found there only.) My first upload to YouTube was The L.L. Bean Boot. About 13 of my early travel cellphone videos were uploaded to TwitVid (now Telly.com). For a while, I tried to maintain an Index Page of all of my videos, but it became too much to maintain and I abandoned it. (Retained for whatever use it may be.) I still try to index all my geographical videos on my Photo Page, but I have fallen way behind. I usually announce new videos on Facebook, Twitter and Google+, in addition to adding them to my Photo Page and the Facebook album they are most closely related to. Here is an archive of my Twitter announcements of new videos. On Facebook, I try to index my videos in photo albums by year: 2010, 2011, 2012, but these albums are currently incomplete. Equipment: Most of my videos are shot with my Canon Vixia HFM300 camcorder. I may also shoot some videos with my iPhone or my Canon/Nikon dSLR. I edit with Cyberlink Director on my generic laptop (cheapest one at Walmart). I may stabilize some shaky videos with the YouTube editor.